There is no longer any question that exercise is good for both mental and physical health. For some unknown reason, the numerous benefits of exercise are often neglected in older adults. Exercise is important for people of all ages and more so for older adults- its benefits are far more durable than any prescription medication or diet. There is ample evidence indicating that any type of exercise that older adults do is better for preventive health than pharmaceuticals. However, it is important to be thoughtful when recommending exercises for older adults. Some are frail, some have balance problems and many others have some type of co-morbidity like high blood pressure, arthritis, diabetes, stroke or heart disease. Hence recommending intense physical activity is not realistic or practical. However, without a doubt, for the majority of older adults, almost any exercise is better than no exercise. To gain the benefits from exercise, you do not have to join an expensive gym or run a marathon each weekend. Since many older adults have lower exercise endurance and decreased strength, the best exercise to start with is walking. Walking when done on a regular basis has many benefits, including weight loss, lowering of blood sugars and blood pressure and improved mental status. Plus, walking is free, allows you to enjoy nature and is safe. However, to gain benefits from walking, you need to do the exercise regularly or at least 4-5 times a week for 30-45 minutes every day. You should take advantage and exercise outdoors as it will give you the much needed sunshine that is necessary for bone growth. Stretching is a very important benefit to everyone but especially older adults. Stretching can be done prior to any formal exercise or it can be done as an exercise itself. Stretching increases flexibility of the joints, reduces muscle tightness and lessens the risk of injury. There are many types of stretching activities that one can perform either indoors or outdoors. Two great ways to incorporate regular stretch activities are to take yoga or tai chi classes. Both these exercise can stretch groups of muscles and also have mental benefits. When it comes to exercise for older adults, it does not have to be a formal regimental program. It can be anything that involves some physical activity. This may include gardening, swimming, riding a stationary bicycle, walking the dog, spending time at the mall, or taking the stairs instead of the elevators. Do not use your car just to buy groceries from the corner store, but walk instead. To enjoy exercise even more, ask a friend to come with you so that both of you stay motivated. Once you have developed adequate stamina and endurance you can then perform any type of aerobic exercise that you want. This can include cycling or swimming. Strength exercises that older adults can do include use of exercise machines or calisthenic exercises like sit ups (using the floor or a chair), leg raises, squats and more. For older adults the goal is not to get you ready for the next Olympics but to derive the health benefits. So if you feel tired, take a break. When should you start to exercise? It is never too late to start exercise and any exercise is better than no exercise. If you have never exercised, start slowly with walking. It is not necessary to join a gym since most gyms charge high fees and/or contracts. There are plenty of exercises that an older adult can do at home for free. If you do not know where to start, there are many local community programs for older adults like the YMCA where exercise programs are held regularly. 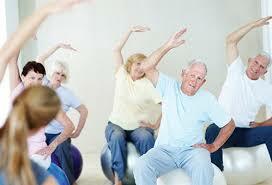 In order to derive the benefits of exercise, older adults should exercise regularly. The benefits of exercise are sustained and can significantly improve your health. Overall, older adults who exercise tend to have fewer health problems and doctor visits or hospital visits. More importantly, older adults who exercise also tend to have a marked reduction in dementia. One of the biggest benefit of exercise in older adults is the improvement in mood. Countless studies show that older adults who exercise regularly have better concentration and long lasting memory. More important, exercise has been associated with marked reduction in stress and anxiety in addition to lower cholesterol levels and decreased risk for hypertension. It is best if you see your healthcare provider before you start exercise. In some cases, you may have to use an ambulatory device like a cane or a walker to maintain stability. Finally remember, even though exercise does have many health benefits, you also need to eat a healthy diet, discontinue smoking and limit the intake of alcohol. Staying active will help you remain independent, mobile, and have a much better quality of life. So do not wait start walking today!